The cliff shadow is an angle curtaining the valley floor with granular dusk. The setting is the Pamplona Lodge common area. Fifty of us sit at round tables. Tattoo free young people in kitchen whites are busing our used dishes. The inside furnishings are reminiscent of college dorm rooms: the sofas are long and blockish with navy fabrics; wood coffee tables are between them and have that plain IKEA look. Scant attention has been paid to decorations. The posters and prints that are hung relate in some way to New Zealand hiking. A bookcase is in the corner and is filled with 1990s Nat Geo magazines and pulp paperbacks crusty from non-use. The most worn spines belong to nature-type field manuals like bird watching guides and plant directories. A smorgasbord of board games are in a pile, flattened and yellow tinged the way board games discovered in attic chests are, corner seams torn from the flattening. A guest book is on a table, and a blank page is headlined with today’s date. Log entries go back years, containing mostly mundane exclamations (“We had a sunny day on the Milford!”; “My clothes are so wet!”; “It didn’t stop raining but we had such a great time today!”), but there are a few pages that have immaculate color pencil drawings of keas or ballads of inferior verse. There is a stack of similarly sized guide books nearby. Called a tree house, the Pamplona Lodge is actually a congregation of I think five structures—land based—interconnected via covered wood walkways. It’s the way their roof tops pop out of the dense fern forest they’re built into that gives it the tree house aspect, like they’re poking from actual lofty canopy. Above the forest, across the valley, is a screensaver worthy mountain cliff. It reminds me of one of those modernist pictures where the artist takes an everyday object with dense, engineered innards and simply splits the object in twain and photographs the side view of one of the halves. From my far down vantage the cliff’s scalpel edge is smoking. Just beginning to disappear behind it is the sun, which has been on a slow hop-scotch across the blue divide between the valley’s opposing mountains. The cliff shadow is an angle curtaining the valley floor with granular dusk. The Lodge was designed to maximize the sun’s effect—the walls and the first quarter of the roof are windows—and most hikers spent the late afternoon sprawled on the sofas while sipping tea, eating cookies, and delighting in the radiance. The next morning the same vantage would sight cloud and rain. Rain would freckle the windows and the aggregate of drops would turn the landscape beyond into a mottled mass. The grander setting is the Milford Track. I’m on it with Ultimate Hikes, which runs a government sanctioned monopoly of guided walks on multiple New Zealand trails. And what I am now trying to determine is the wisdom in and justification for spending a lot of money on a four day hiking trek that comes with hot showers, drying rooms, comfy beds, full dinner services, and electricity. Hiking the Milford Track to begin with, Ultimate Hikes or not, is a bit of an indulgence. Simply getting there, assuming you belong to 99.99% of the world’s population that doesn’t live in New Zealand, requires a vertigo inducing 10+ hour international flight, a regional jet to Queenstown, a four hour bus ride to Lake Te Anau Downs, and then a one hour ferry ride to the trailhead. Hiking the Milford Track to begin with, Ultimate Hikes or not, is a bit of an indulgence. Fiordland is a land in opposition with itself. That Fiordland is accessible at all is an example of our (man’s) incredible attempts to corral nature for our own pecuniary and sight seeing benefits and nature’s constant, gallant attempts to frustrate those purposes. Fiordland is a fantail of land that begins halfway down the western side of south island and extends to the bottom. It is south island’s stoic guardian agains the Tasman Sea, which pummels it with gale winds and rain. Milford Sound receives, on average, 6,412 mm of rain each year, which makes it one of the wettest places on Earth. For some perspective, perpetually damp Seattle receives 952 mm. A plethora of mountain ranges lace the area, and the rivers between them wiggle through like capillaries on a drunk man’s nose. There is constant destruction and constant regeneration; Fiordland is a land in opposition with itself. The tectonic plates are prolific here, each year pushing mountains up by 10mm, but the trio of forces—wind, rain, and water—impedes any advance by shaving each of those millimeters off, so the mountain peaks that are stiff with snow year round are made stagnant by the sky they tarry in. Landscape altering events are literal scars on the environment: portions of mountainsides have crumpled into valleys and splintered the gigantic beech trees that grew for centuries beneath them. And if weather has moods then they’re most evident here. The weather is pestilential. Each sunny day is punished by a week of rain. Days that dawn sunny and warm are by noon fog blasted and torrential. On the day we were to hike Mackinnon Pass, a 1,154 meter above sea level mountain saddle that is the track’s only real rigor test, what had been morning blues were altered gray, and rain fell heavy. By the time we had reached the pass and descended to the valley on the other side, all hints of the weather tantrum were gone, and the sun shone hot with little covering cloud. In between though, rain polished the rocks on the trail so they looked emerald. Waterfalls were sprites on distant mountain sides. Climbing the Pass’s switchbacks meant we were buffered from wind, but when we reached the saddle the wind hit us uninhibited. Rainfall that the mountain moss could not hold poured into gullies that ran at our feet. They followed the saddle’s downward angle to the cliff edge. Beyond the edge was a thousand meter drop, straight down, no ledge or piedmont to stop whatever object was dropped from it until it hit the valley below. The wind bowling down the valley on that side hit the cliff and fluted up, and as the water in the gullies poured from the cliff edge, ready to spray down into vertical oblivion, the wind from below lofted it skyward. Fiordland, I learned, is a place where waterfalls fall up. Yet there we, humans, go. The mountain tunnel to Milford Sound took eighteen years to complete (World War II interrupted the work), and requires a power station and numerous compressors to pump out the 40,000 liters of water that per hour percolate through the rock so as to allow mega buses filled with tourists to make their way to the tour ship terminal. At Mackinnon Pass, signs advise groups to remain together during their crossings. A shelter is built at the top to provide protection, yet a plaque inside commemorates that it is the second hut built in this location, meaning that the previous one was blown off its foundation, the material scattered like confetti towards the valley it looks over. Helicopter evacuations are frequent. In my Ultimate Hikes group, a woman came across a man whose head was wedged between two rocks on the Mackinnon Pass ascent. Blood spooled out of a head gash. He was air lifted out with five broken ribs, a concussion, torso contusions, and a punctured lung. The rescue helicopter was delayed in arriving because another one was already in the airspace to remove a different injured hiker. It seems to be a very human quality to impose our presence on a place that so blatantly does not want us. The idea that certain parts of our planet have a character opposed to our existence might not cross the minds of their initial explorers. But even for a non-spiritual person like myself, it is impossible to not become addicted to the almost lethal spirituality that exist in these places. Human religions demand that we look up to worship—e.g. cathedral architecture galvanizes your eyes skyward with their abundance of stained glass, gilded ornaments, and out-of-ratio-with-reality mosaics—but a mountain demands that your eyes be low and high. The terrain captures with scope the entirety of your perspective by putting hail into your eyes, wrapping your body with a concussing pressure of wind, while allowing the far off landscape to moil in elemental ferment. At Mackinnon Pass, signs advise groups to remain together during their crossings. Shelling out a gross amount of money is exactly what I did. To be clear, however: the Milford Track is not a permanent place of danger, nor even a frequent one. But as is true of any distant, natural place, Milford is not without risk. The nearness to danger is better characterized as a flirtation with its most mild form. It is possible to sense the landscape’s intolerance of you without feeling threatened by it. This is caused partly by the layout of the track itself. As far as hiking trails go, the Milford is not a hiking trail, and, other than Mackinnon Pass (which is a remarkably easy hump), it could constitute a glorified stroll with 53.5 kilometers of well maintained, flat track that’s essentially two valley walks with a mountain in the middle whose terminus is Milford Sound. It is also partly the result of the DOC’s total charge over the track. The Track’s unique geography—ingress and egress points that require water taxi transportation—lets the DOC control exactly how many people begin each day. To even board the ferry that’ll take you to the trail head, you must show proof of bookings for each night and receipt for the taxi at track’s end. So only forty hikers with a DOC booking start each day. And, since the track is one way, the advertisement is that you’re less likely to pass another hiker and therefore more able to experience Fiordland’s unadulterated nature. There are moments on the Milford when it is possible to think you’ve stepped into the Tertiary period before man. The water here is so clear that if it did not move you could look at a sand bottom four meters in depth and see with such clarity its stones it would be as if you held them in your palm. Trout the size of children slink through the gelid blue. Certain birds—the whio blue duck, for example—are so rare that spotting one requires informing a track ranger. 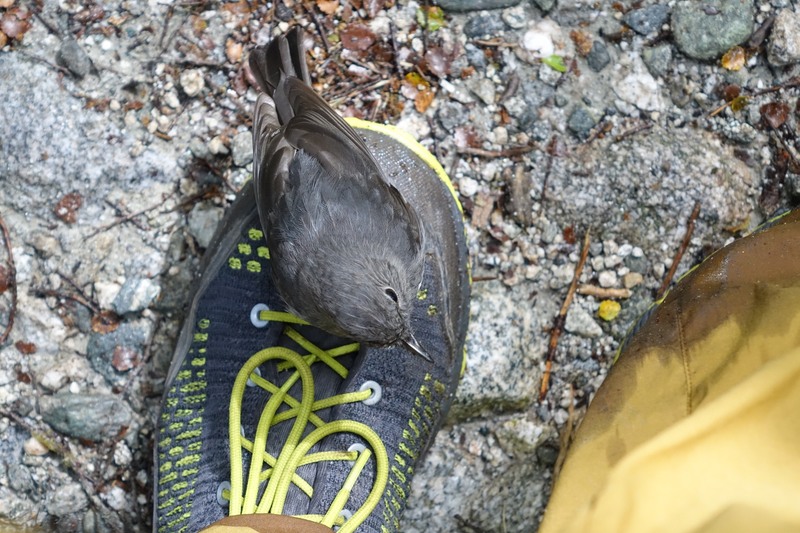 And other birds are so ignorant of people and our harms that they quite literally peck on your shoelaces. The DOC has successfully industrialized out the type of industrious human behavior that would entirely ruin a place like this. For the above reasons, and because of over a century of successful marketing that’s caused the track to gain international renown, the Milford is often referred to as “the finest track in the world.” I was pulled to it partly for this reason, even if it is, as travel writer Paul Theroux wrote back in 1992, “simply tourist board hyperbole.” Mine was not a unique fascination though. If using the objective metric of how difficult it is to secure a DOC hut booking, the Milford is New Zealand’s most popular track. Each of the three DOC huts get booked out rapidly after the booking period’s opening. Other popular tracks, such as the Routeburn and Kepler, do not fill nearly as fast. And still others, the Rakiura for example, can be booked a day before starting out. Absent winning what is essentially the Milford DOC hut lottery though, you will never get to see the place. Unless of course you decide to shell out a gross amount of money to do a guided walk with Ultimate Hikes. I would be in New Zealand for one year with the chance that I would never be back, so shelling out a gross amount of money is exactly what I did. It is a bit difficult for me to write this part since I come from a family that values thrift and financial modesty. To give you some idea, my dad drove…well, drives…a 1986 Ford pick-up truck. The cab interior is upholstered with Mexican serape style carpet, and I remember going on junk yard excursions when it needed a new bumper. The top speed is 85 mph. Top speed as in the highest speed labeled on the speedometer, not the speed at which the truck begins to convulse. That would be 55 mph. In San Diego, where the Mercedes, Lexus, Insert Brand of Luxury Car Here, is so common that it’s a trope, seeing Ole Blue in the after-school pick-up line up was, for my sister at least, down right mortifying. She’d duck in the cab so no one could see her, or instruct my dad to park off campus and she’d meet him. Our house’s interior is that manufactured wood with dark varnish that might have made an design splash when it debuted in 1982, but has since been modeled as the “Before” picture in every HGTV show ever. The hallways and living room are a gallery for my sister’s artwork, with particular focus on her preschool to first grade period. When the armrests of my dad’s banker chair wore out, he had the entire piece re-upholstered with Hawaiian print fabric. And, anyways, you get it. Pricing for Ultimate Hikes rooms begins at around $2,000 NZD. They cap at close to $3,200, which is for an en suite double. This is per person. There’s no promise for poshness. Ultimate Hikes promises dryness and comfort in a place that nearly guarantees that you will be wet and uncomfortable—all the glossy pictures of smiling hikers viewing an eye-wateringly clear and blue Milford is at best propaganda and at worse fraudulent inducement (that our group enjoyed nearly three days of pristine weather was an anomaly). The Going Guided column even lists “safety is paramount” and leaves the Going it Alone equivalent is ominously blank. Our house’s interior is that manufactured wood with dark varnish that might have made an design splash when it debuted in 1982. We came in as strangers, we leave as friends. But here’s an admission: an Ultimate Hikes guided walk is outstanding. The cost and its beyond-all-rational-distance-from-reality suggest that partaking in one would be a once in a lifetime experience, but for many of the people in my group, the experience was their second or third. My roommate, a fastidious and neat engineer from the base of Mt. Fuji, was on his fourth Ultimate Hike. An older Australian couple who had come after their marriage were back, decades later, with their daughter and her husband. At each hut the four of them parsed back through those old guest books to see what the newly weds had scribbled. To a person we were impressed with the food offerings and raved about the professionalism, dedication to safety, knowledge, and attitudes of our young guides. We eagerly filled in our names and email addresses on those “Keep in Touch” sheets that must be included in any “we came in as strangers, we leave as friends” group itinerary. The reason it is outstanding is due to what having all the details of societal type living taken care of does for you. Ultimate Hikes will cook for you, make your bed, dry your clothes, worry about how you get from point A to point B so that what you can concentrate on is you. They create an emotional buttress so that while you hike and are slopping through mud and are so wet you might as well be in a tub, your complex interior monologue can focus less on the sacrifices of comfort and more on what you are experiencing. And, trust me, if you have ever made a bed sheet purchase based off of thread count then I am describing you. 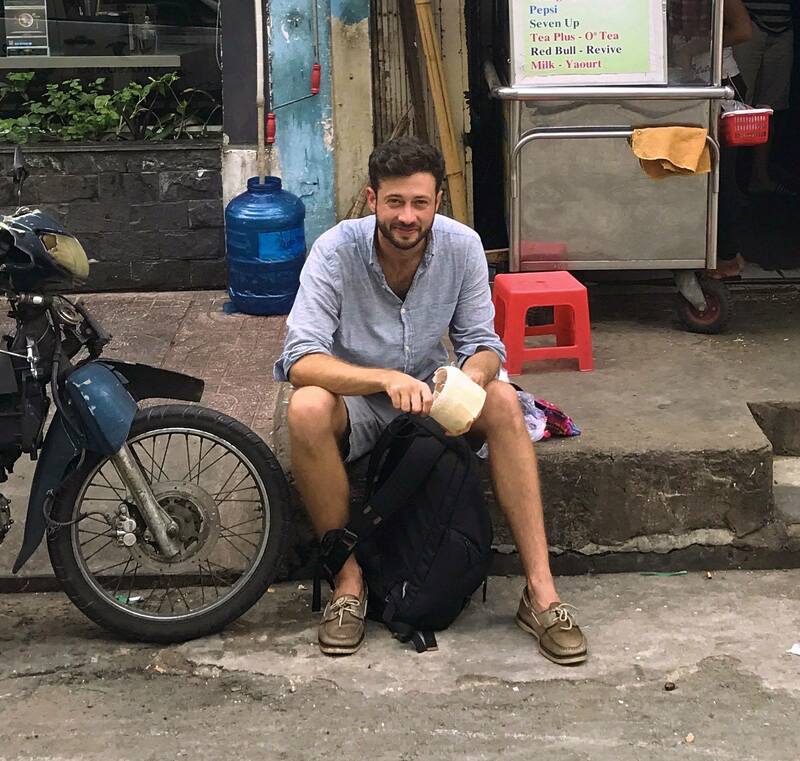 While in comfort it’s possible to cast off the notion that you’re spoiled and believe you can empathize, regardless of what trite injustice or disagreeable scenario you’ve been put in, with the people in the world who have real problems and who tolerate more than cold and rain on the daily. But when you are wet and cold, and when you are used to not being wet and cold, then it is difficult to concentrate on much else over a long period. You may still appreciate the moment for what it is, but the high of sensory discovery is like any other high and it will have its commensurate low. What Ultimate Hikes does is catch you during that fall with creme brûlée padding and lay you into soft linens. There is another cost, however, one that goes beyond the line on a Master Card bill. I’m back and forth about whether I should itemize or whether I should lay out my subjective opinion. Since it’s less judicious but more expedient to do the latter, I’ll say that I question the righteousness of expending even a minute portion of our world’s non-renewable resources to provide totally unnecessary comforts so that very rich people who are not in great physical shape can enjoy a distant outdoor place that would get along fine without them. The crates of salmon, the ice creams, the lunch meats and cheese and breads put out for self-service lunches, the diesel gasoline used to power the generators, all this is helicoptered in. There is no limit to the amount of hot water one can use. People, myself included, stood in showers that were boiling until steam had made drawing boards of the mirrors. Whatever wet gear we had at the end of each day we stripped off and hung in oak and cedar drying rooms that were furnaced to be like a dry sauna. I felt my lungs constrict and the pores on my face contract as if they sensed that each water molecule in me would simply evaporate if no action was taken. Drape your merinos and wools, have dinner and then come back, grab them, and they’d be toasty enough to melt butter. The generators went off at 10 pm each night and turned on at 6 am. When on they and a combination of solar panels produced enough wattage to fill those water tanks and power those heating rooms, but also to launder fifty some beds worth of linens in industrial washers. “This is an expensive operation,” one guide noted. When the hike ended we were boated to Milford Sound. 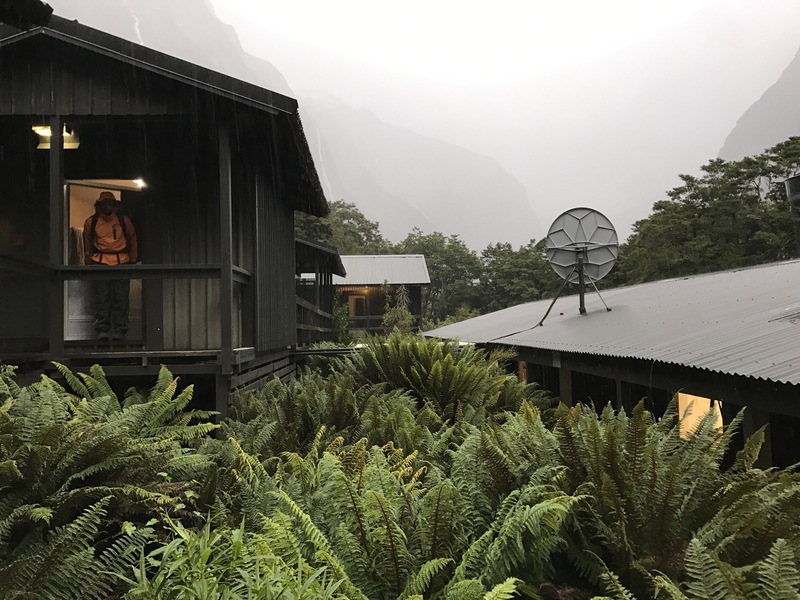 Our final night we stayed at Mitre Peak Lodge, an older lodge that even when full felt empty and had an Overlook Hotel vibe. Ultimate Hikes threw a celebratory cocktail hour in the greenhouse-like bar that faced Milford Sound. Milford Sound on this day, clear, angelically gold, was imperial, its peaks risen like on a crown. Guides went through each hiker’s name as if we were at a graduation ceremony and handed out certificates of completion, which they joked would qualify us to serve in New Zealand Parliament. The feeling was festive, but I felt in a trance with Milford Sound in the background. It demanded to be looked at. I think I stayed in this trance through to the next day. The weather for the Milford Sound cruise ride was more typical. Rain and wind had scuttled all hopes to see the length of the Sound with pristine clearness. Wind blasts knocked people against walls, and people scuttled to grab handle bars while loose trash flew off the hull. Sea lions keep uneasy peace on tide licked rocks. Penguins struggled up sheer cliffs for shelter. Birds vied against boom blasts of winds that made the Sound top undulate. I went inside and sat in the dry, humming comfort of the cruise ship. As we came to the Sound’s mouth, the Tasman a darig blank space beyond, the weather became an actual tempest. But the cruise window blocked it all. I had my tea and ate from my bowl of Anzac biscuits, enjoying nature from within prophylactic protection. That is, after all, what I paid for. 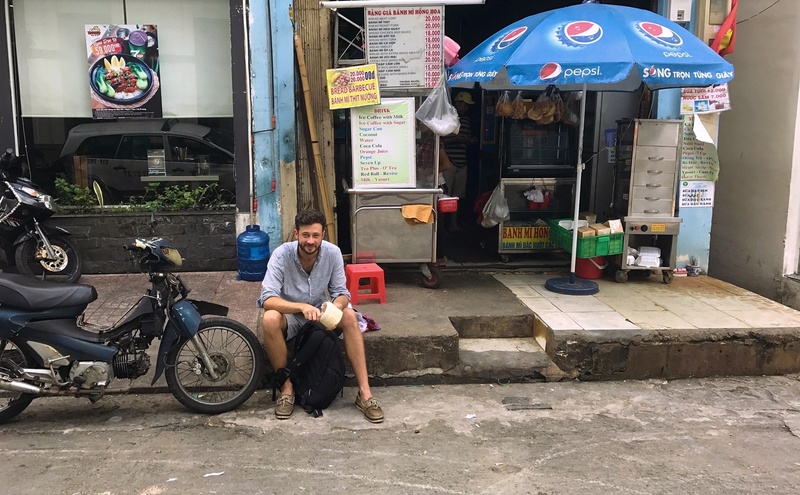 Antonio Perez is a former New York City corporate attorney who quit his job, sold his things, and bought a one way ticket to the other side of the world. He lives in Melbourne but travels extensively, writing along the way.